Today we have exciting news. It’s time to announce the winner of the 2017 D Franklin Defying Doomsday Award! The 2017 winner is the Kickstarter campaign for ‘Disabled People Destroy Science Fiction’! 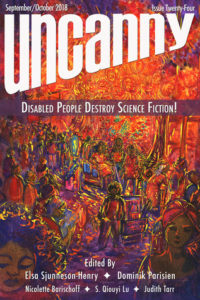 Disabled People Destroy Science Fiction was a special issue of Uncanny Magazine featuring editors, writers (both solicited and unsolicited), and artists with representation from all across the sliding scale of disability. Congratulations to Elsa Sjunneson-Henry and Nicolette Barischoff as well as all those who wrote, organised and promoted the Disabled People Destroy Science Fiction Kickstarter campaign!